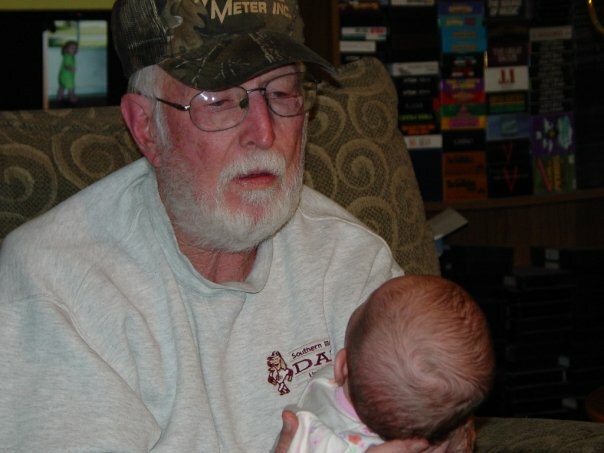 “(late) On Sunday, October 11th, 2009 we were home after 23 long days away. Our life had changed irreversibly. One chapter closed and another started – as it had on our wedding day. We put Abigail in her bassinette and went to bed. I awoke hours later thinking the baby was choking, but it was only Mau the cat sitting on our comforter giving us a welcome-home hairball. Five Years Ago Today – familiar places and faces. We come home. October 11, 2009. A train ride from Washington to Chicago to St. Louis … breakfasting with British cousins and putting up with the Australian Octomom and Captain Dig Me. Then finally … finally …. By six that evening we pulled into the St. Louis station. My father was there to meet us. Two days before, late that frantic Friday afternoon, we called him to give him the news. “So you’ll be home Sunday night,” was the first thing he said. “Your sister called me. She saw it on the computer.” He volunteered his time working for the city clerk, and the clerk and his secretary kept a Facebook watch to give Dad all the news. And now here is my father waiting for us at the station. I have never been happier to see his face in my adult life. He said he finally has a brown-haired brown-eyed girl; he has always wanted a brown-haired brown-eyed girl. He drove our car to the train station. We had a baby seat installed for free that summer by the fire department during one of those baby-seat safety seminars they give a few times a year. When we got south of Mascoutah, Abigail cried. Esther asked us to pull over so she could feed the baby – Dad and I rode in front. We told her to take her out of the seat and feed her. “No jury in the world will convict us. All we need is one mother on it…” It’s good to be a lawyer again. We went to my sister’s house in Coulterville. She took plenty of pictures and plenty of children looked at their new cousin. 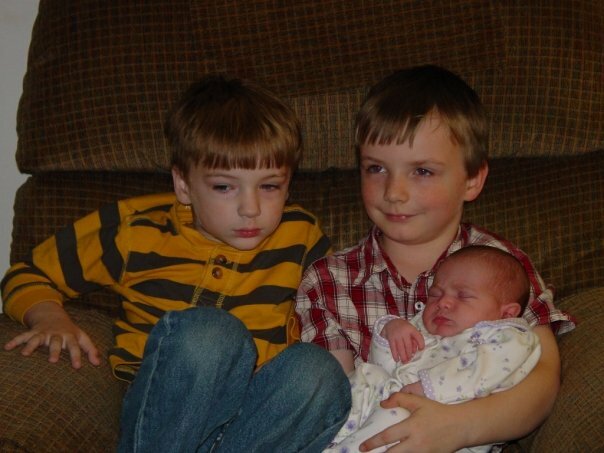 My sister held Abigail the entire time. 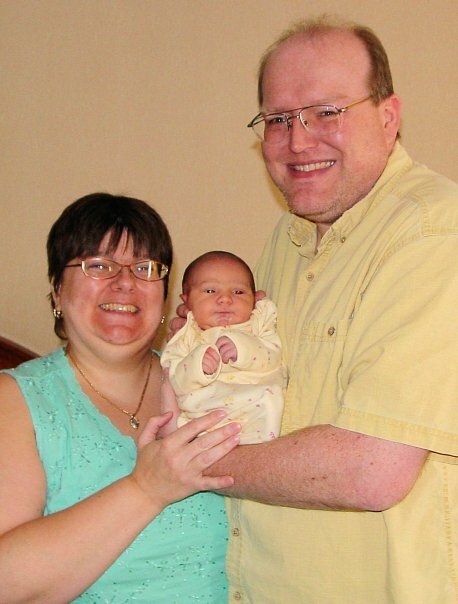 We found out later that she was pregnant at that time – she just found out – but kept quiet for a few months to let Abigail be the only baby for a while. The plan was to stay in Coulterville at Dad’s house overnight. But we wanted to go home. We’ve wanted to go home for the past 23 days. Now that we were an hour away only extreme fatigue would stop us. We said our goodbyes, loaded up on caffeine at the convenience store and headed home. Our other babies, the cats, stayed in the basement this entire time. Relax, our basement was bigger than my first apartment. We asked our house-sitter to let them up from their basement home the day before. When I walked in with our luggage, two of them sat by the dining room table and watched who came in. I called their names. When Warlock saw me, he stalked toward me. I petted his head as Esther came in with the baby. 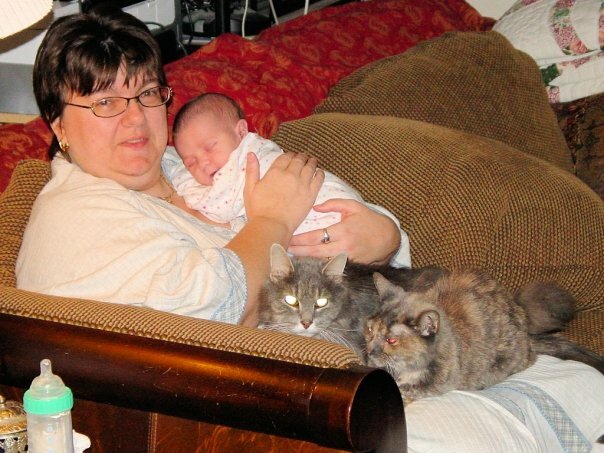 By the time I moved the car to the garage and came back inside; Esther sat on the floor as the cats rubbed against her and the baby seat. Warlock sniffed at Abigail. Abigail stared back. I snapped a quick photo. The caption: “What the hell are you,” each asked the other. Five years ago today: I hear the train a’coming! October 10, 2009. We received permission from New York AND Illinois to go home. We got our train tickets and headed to Penn Station. From there to the nation’s capital. 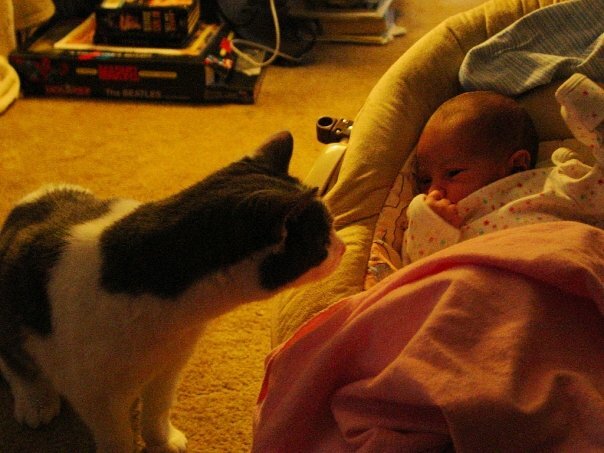 “Among the many nice things about babies is there is no need for an alarm clock. Among the many horrible things about babies is there is no need for an alarm clock. By the time the alarm rang at four that Saturday morning we had already fed and changed Abigail, showered and packed our last bits of belongings. I paid our bill (actually Capital One did and I paid them – still paying them for that matter) and pushed our luggage carrier to the motel shuttle. Other people were on the shuttle for the Long Island Railroad station that morning too. That surprised me – it was 4:30 for gosh sakes! It took a long time to get to the station, and the train pulled up just as we paid for our tickets to Penn Station. We found a nice niche to ourselves and settled back for the next hour or so. The ticket-taker walked past a few times. We laughed as men bolted the train during stops as the ticket-taker approached. They had no ticket and were riding for free. Thieves! 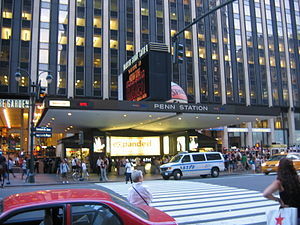 Soon we were at famous Penn Station. I thought about looking around, but decided against it. It was a long walk to the Amtrak station, but the way was clearly marked. There were a few homeless people sleeping in the hallways as we passed. We don’t have much of that in our small town so it was hard for me to ignore them. I thought about the hundreds of people that pass by without as much as a glance. Are they cold for doing so? No, not really; but that in itself is also a problem, isn’t it? A friendly Amtrak lady checked us in and told us that since we had a sleeper car for the trip from DC to Chicago, we could stay in the VIP lounge at all three stations. We were prepared to lay on benches and wait, but instead spent our layovers on comfy couches with clean bathrooms and complementary sodas, tea, coffee and snacks. 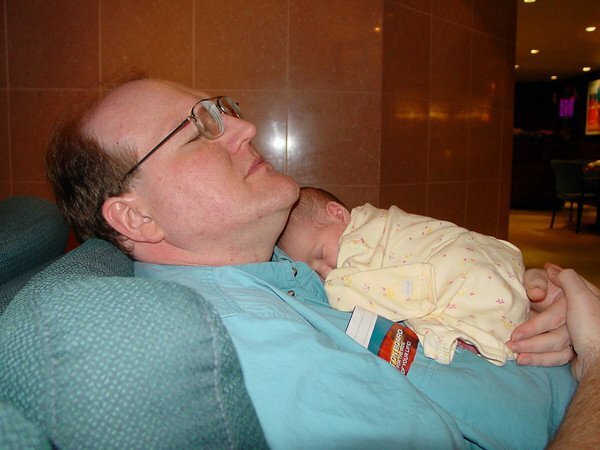 I kept Abigail snuggled on my chest while in the lounge at Penn Station. The train to Washington DC was delayed in Boston for several hours. I wasn’t worried about missing our connection – it wasn’t for another twelve hours. Five years ago today – we’re coming home! Noon passed. So did 1:00. Then 2:00. Then 3:00. Esther lay down in bed and cried. A few minutes later she fell asleep. The baby was fed and she slept as well. I stayed up and played World of Warcraft and waited for the baby to wake up. Soon it was four o’clock our time; three o’clock in Illinois. Three o’clock the Friday before a three-day weekend at a government office. By now people were sneaking between the partitions and cubicles, jumping through the bathroom windows and pushing their cars out of the parking lots. Once out of earshot they’ll start the engine and get the hell out of there. 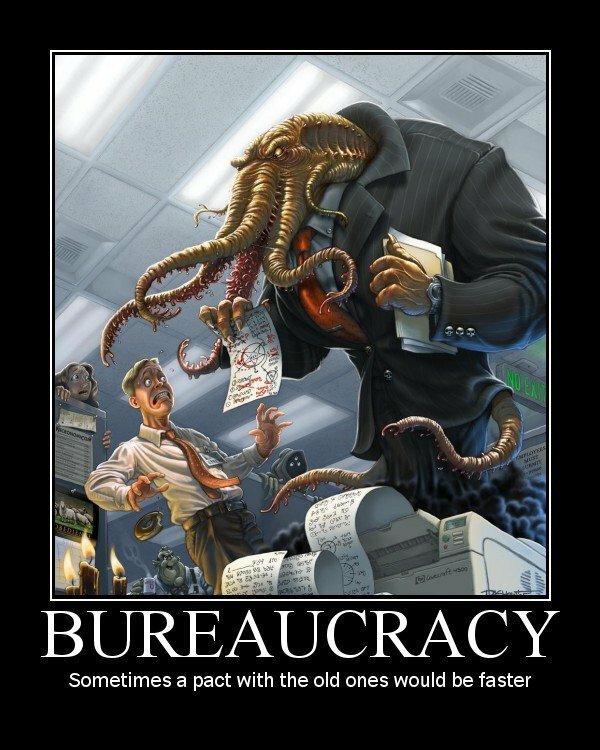 The smart ones took that Friday off months before – those left were the bitter employees who were too late to get their vacation requests approved in time. I was ready to hit “Send” when Esther’s cell phone rang. She woke up and said hello in a groggy voice. We were approved to take the baby home. “Ronnie called us on Thursday, October 8th. The state of New York cleared us for interstate travel. Nope. Illinois has to approve it, too. The paperwork is scheduled to arrive in Springfield tomorrow at 9:00 am. Um, wasn’t that supposed to have been done Monday? The timing could not have been worse. If the Department of Children and Family Services – or whoever would be in charge of such things – verbally approves our taking Abigail to Illinois Friday, we can go home. That Monday was Columbus Day. If they didn’t approve it on Friday, it will be Tuesday. Or later. One of my very best friends from law school works in Springfield for the Illinois senate. “Maybe we can call him and see if he can help,” Esther said. I said I doubted that he could. We didn’t call him. 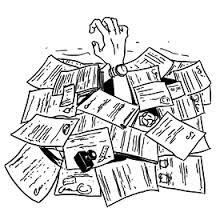 Esther got on Facebook and asked friends to pray the paperwork was on the top of the anonymous bureaucrat’s pile. “We’re not doing anything that will get us in trouble,” Esther said. She was right of course. And if it came to it I would have stayed. I just felt like saying it out loud. That evening we ate at a 1950s-style diner. The waitress oohed and aahed over Abigail. An older couple came over to see her, as did a small child (Abby does that now – she’s done that ever since she’s been able to walk – babies love to look at babies). It was a wonderful meal. It was a wonderful diner filled with wonderful people. “I drove the car to the hospital entrance, just as I did half a decade before during Esther’s battle with the fibroids. After a few minutes waiting, I walked back into the hospital. Esther, Ronnie and a nurse turned the corner and I led them to the car. On the steps Ronnie handed Abigail to Esther, who put her in the car seat. This was the baby carrier/car seat combo we got when we rented the car. We had something like that in our car at home, too. The car seat pops off and we have instant baby carrier. The nurse wished us luck and Ronnie said he would call us in a few days. He congratulated us and gave Esther a pat on the shoulder and shook her hand. He came around to the driver’s side and shook my hand, too. We stopped by Target to buy supplies and formula. 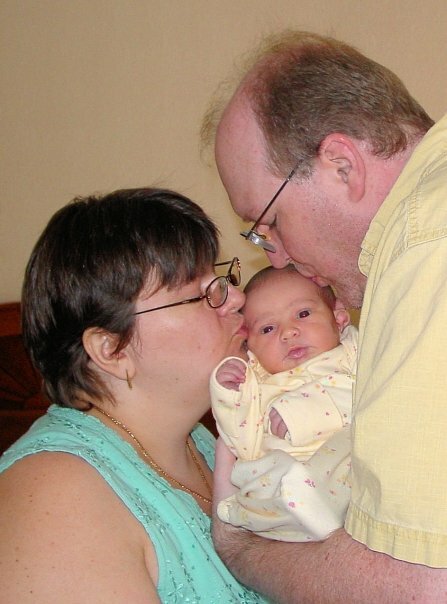 This was during the big Asian flu pandemic and I worried about someone sneezing near our little baby. Esther said it would be all right. We bought diapers with Big Bird on them. Ah, the crass commercialism starting from day one, well, day three. I took a Diet Coke from the mini-fridge by the check-out counter and it was warm. Every bottle was warm – the fridge wasn’t working. The only other mini-fridge with Coke products was several aisles down, but I found a cold bottle of the stuff eventually. We each used the restroom then back to our motel with our little girl. I learned how to use the camera timer and took pictures of the three of us. 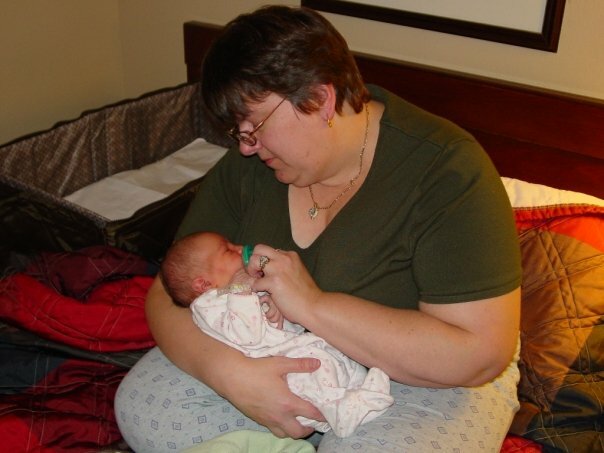 Then some photos of Esther feeding Abigail for the first time. She took photos of me holding her and mugging for the camera. 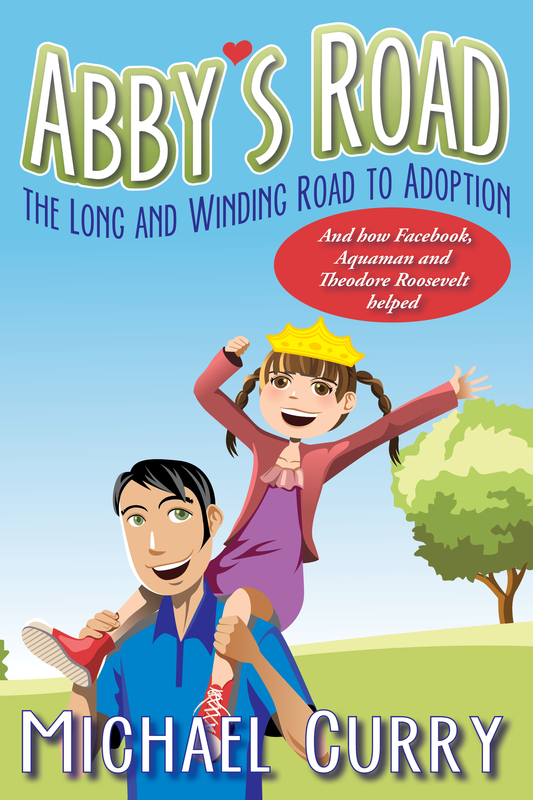 For the first time – for us anyway – Abby’s eyes were open and she squeaked and cooed. She had beautiful dark eyes – nearly black. I tested her grasp reflexes. Grasp reflexes were mentioned in all those books I read months before. Abigail grabbed my thumbs tightly in her little hands. This is, supposedly, a throw-back to the days when babies held on for dear life to the hair on their homo-habilis mommas as they climbed from tree to tree; this was back in the day when the appendix and the tonsils had a purpose. My little Abigail snuggled on my chest. She was as tiny as the baby dolls we bought for her. It was October 3rd. It was exactly – exactly (even to the hour) – nine months ago I asked Esther if she would consider adopting. 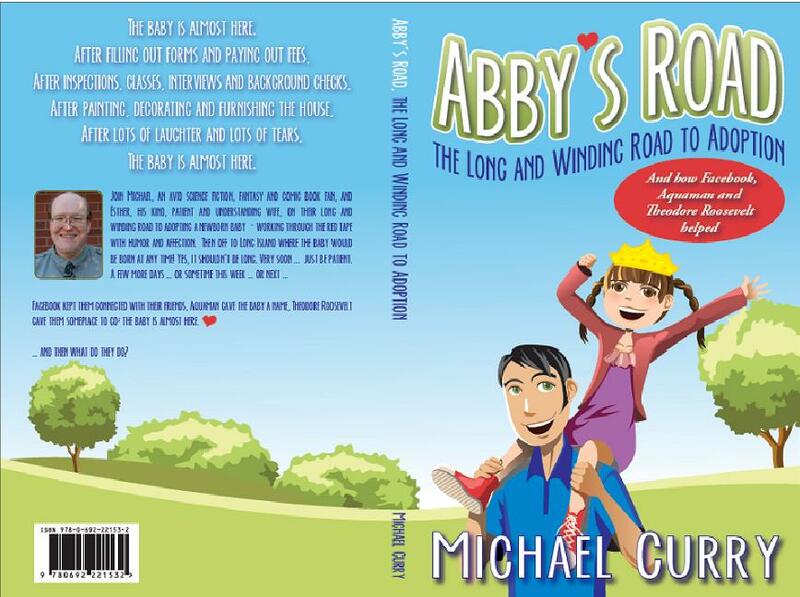 This will be the last Abby’s Road anniversary for many days – we have a baby to take care of!